It is the Watershed that provide many of us with our drinking water supply. So, they are extremely important . Along with it, It provides recreational opportunities and aesthetic beauty. The thing that is required is to protect and conserve the watershed in its natural way .However the health of a watershed mainly depend on Forest areas. 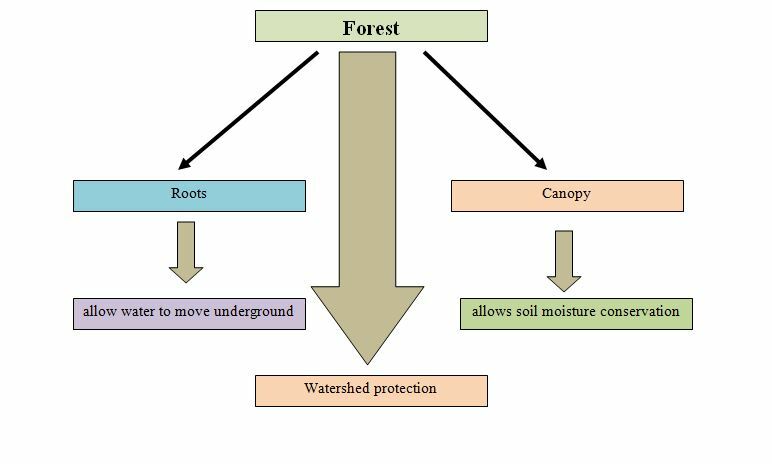 The absorption of moisture by the plant cover and leaf litter helps to maintain soil structure, while the water get stored in deep underground by the root masses that keep soil permeable for a fast and easy movement of water for storage . It possess a filtering role in which water get filtered and reaches to the water body In current time, impervious surface like metallic roads are taking places of vegetation posing a negative impact and threat to watersheds. This in fact increases the amount of runoff flowing with an increased velocity causing erosion. It also acts as a carrier of pollutants such as oil, bacteria, nutrients, sediment and metals into surface waters along with it. Only wanna comment on few general things, The website design is perfect, the content is rattling wonderful. “Art for art’s sake makes no more sense than gin for gin’s sake.” by W. Somerset Maugham.